The need to keep people safe versus concerns about privacy. What constitutes a “good citizen”? Did his act of civil disobedience do his nation a service or is he a traitor? Does a good justification for what is considered a crime make it just? Herbert Hoover, the 31st President of the United States said that there are only two occasions when Americans respect privacy: prayer and fishing. Snowden’s act of whistleblowing revealed that ordinary citizens, not just Americans, are being snooped on through the collection of metadata from telecommunication companies in an Orwellian fashion. Are you aware of how much information you willingly share by simply using your mobile phone and the internet? Does it surprise you that the information you divulge by using these service is being collected and retained? Privacy, individualism, and national security. After serving as a high-level technology and cyber security specialist across US government agencies, rising through the ranks and gaining clearance levels and AAA access, Snowden became a hero to all who value governmental transparency and a traitor in the eyes of others as he revealed to the world that the National Security Agency (NSA) was seizing private records from billions of everyday civilians. He was made a public enemy, his passport was revoked and he was forced to seek political asylum. Edward Snowden has been living in exile for the last three years. 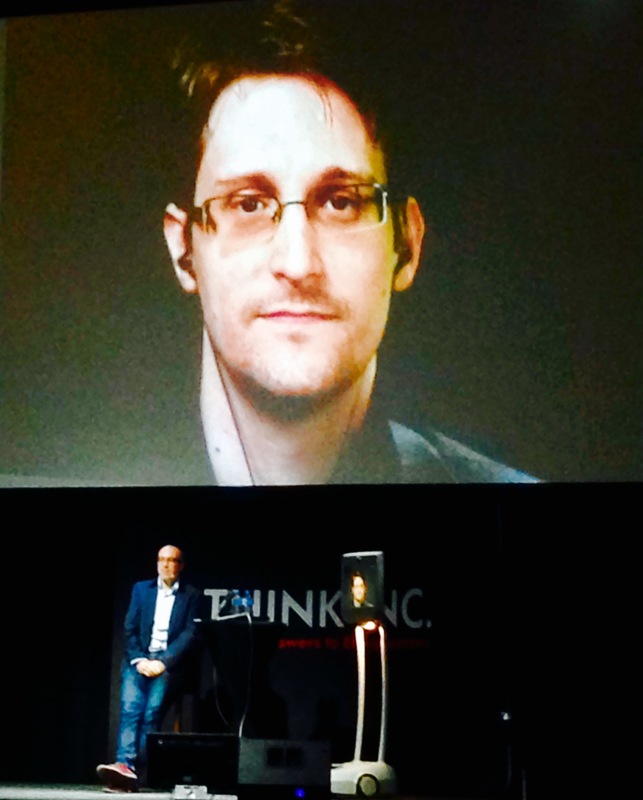 From his exile in Russia, Snowden appeared live via a video link to be interviewed by Julian Morrow, best known for being a member of the Australia satirical comedy group The Chaser, and given opportunity to explain why and how he did what he did. Advocating intellectual discussion and striving to challenge the status quo, the organizer of “An evening with Edward Snowden” Think Inc. is a young, Australia-based initiative dedicated to “reinvigorating the excitement of rational discourse in daily conversation.” Think Inc sees their mission in amplifying the dialogue between inquisitive members of the public and those making significant strides in their academic and professional scientific fields through a series of lectures and Q&A sessions. Snowden is first and foremost a gifted techie. A personable techie with the ability to communicate complex ideas with ease to a broad audience. In conversation he proves to be an eloquent individual with a composed and self-assured manner who uses rational, factual arguments that are well thought out. He has become a seasoned professional when it comes to dealing with media, answering curveball questions with poise and not unlike during previous public appearances, he was well prepared and used the evidence of his accusers to diffuse their bullets and make his points. Snowden is fairly skeptical of the argument used by governments around the world that mass surveillance programs are necessary to prevent terrorist attacks, which is used by the NSA as a justification of their practices. While that might be considered a noble cause, Snowden makes the case that the information gathered on individuals and groups by spying on journalists, governments, etc., is mostly used for political and diplomatic advantages and that there is no hard evidence that mass surveillance has lead to the prevention of terrorist attacks. Snowden put emphasis on the fact that privacy is essentially the right to self and how surveillance programs affect the individual. He has a problem with a quote that is often attributed to Joseph Goebbels (“You have nothing to hide if you have nothing to fear”) because of the underlying assumption that privacy is about hiding bad things. By accepting this assumption, privacy is myopically viewed as a form of secrecy and following this logic, Snowden finds that it would equate someone not caring about free speech because one has nothing to say. His deeds and event sparked debate and discussions on a global scale and with attendants of the event carrying on long after Snowden had signed off – specifically regarding the point that Snowden made regarding Australia: In his view intelligence services down under are much more unrestrained than the ones in the new world. If Snowden’s action will eventually lead to reforms remains to be seen.